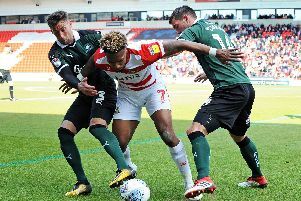 Doncaster Rovers striker John Marquis looks a new man according to the legend whose feat he recently matched. Marquis last month became the first Rovers player since Peter Kitchen 40 years ago to score 20 Football League goals in a single season. Club legend Kitchen has been impressed with the 24-year-old’s impact at the Keepmoat this season – particularly after watching him during a loan spell last term with Leyton Orient, whom Rovers visit this weekend. “Looking at him then, you wouldn’t have thought he’d have been a 20 goal striker,” said Kitchen, who joined Orient from Rovers in 1977. “You could see he had plenty about him, his work rate in particular and that he can hold the ball up really well. “He’s a proper worker and leads the line superbly, which I think is really underrated nowadays. “And he’s shown this season he’s a very good finisher as well. “I think his success at Doncaster shows how important confidence is for a player and for a team. “He is playing with so much confidence, with confidence in how he’s going about things as well as in front of goal. “Darren Ferguson has put that confidence into him, as he as the whole team. “That’s not been the case at Orient for a long time. Some really good players have passed through the club and not been as successful as they have been elsewhere. That’s because of the mood and the focus of the club. Mexborough-born Kitchen was delighted to see Marquis match his 20-plus Football League goals in a season mark and admits the feat was not celebrated as much during his playing days. “I don’t think anyone really made a big deal of it back then,” Kitchen said. “Maybe it was just being humble, being from Yorkshire. “Football is promoted much better now than it was back then. To us, it was just a job and something much better worth doing than going down the pit like my dad did. Kitchen believes the outcome of Saturday’s clash between Rovers and Orient will have little bearing on the respective fortunes of the two clubs. He has backed Rovers to win the League Two title but believes Orient will be relegated out of the Football League come May. He said: “As long as Rovers don’t take the game lightly, I full expect them to win.